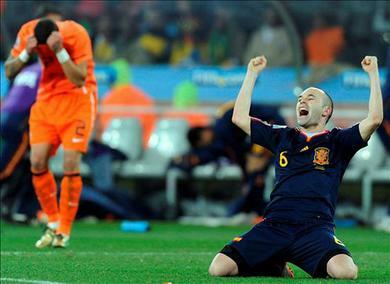 While I was happy for Spain, I must say that it was one of the most boring matches of the whole Cup. If it wasn’t for Nigel de Jong’s Kung Fu Kick (video) and some impressive goaltending on both sides, I may have left the sports bar early. That’s not to say that both teams weren’t playing at the top of their game, but it’s clearly more interesting to see goals being scored than to watch defense-strong teams battle it out for two hours. It would be nice if this win could do something to boost Spain’s economy (they have close to a 20% unemployment rate). With Nadal winning Wimbledon and several other sports successes in the past month, Spain could use a little luck. Back to the US team’s performance…. While it was great to see them make it to the Round of 16, I can’t remember ever feeling so drained after a sporting event as when they lost to Ghana. I must say that Zanzabar has a great following of soccer fans; good crowd with which to watch the game. I went to the Fox & Hound on Sunday for the final and probably would have enjoyed it more if it wasn’t 55 degrees cold in there. Zanzabar, on the other hand, was about 80 – but I’d rather be hot than cold. Someone needs to donate some hi-def TVs to Z bar, too. When the Uruguay/Ghana match went into overtime (my favorite 20 minutes of the whole Cup), I was able to walk down the street after work to Champions on 3rd & Jefferson. They’re all great locations to watch a sporting event. I had wanted to support the independent Diamond pub on Frankfort on Sunday, but there was hardly anyone in there to watch the final match; I guess St. Matthews pool sharks don’t dig association football (aka soccer). Again, I’ll let HuffPost give you a good rundown (my numbers correspond to their slideshow), but I can’t finish up here without mentioning the horribile vuvuzela (6), photos of Mick Jagger (15), Suárez Hand of God (19), Robert Green’s bad goaltending (9), and Paul the Psychic Octopus (1). As always, Boston’s Big Picture has some beautiful photography of the games. It’s been a speedy month of play – and all the sudden it’s over with a long wait until 2014.